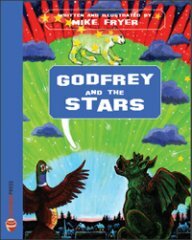 This beautifully illustrated book is about Godfrey, a gargoyle living at the top of the Cathedral and a scatter-brained Pigeon who becomes his friend. They spend an evening stargazing at various wonders as the Moon, the Pole Star, comets and the Milky Way. Mike Fryer from Colchester is a Research Scientist at the University of Essex. He is a brilliant artist, a one-time amateur pilot and has a life-long interest in astronomy, especially the planets. A gorgeous book about an outsider finding fun and friendship, with illustrations so vivid they are almost edible.